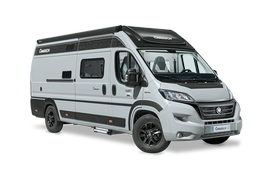 Our CHAUSSON TITANIUM 640 rewarded ! 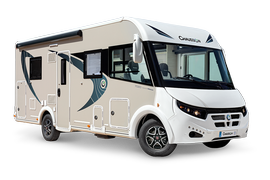 Home page / News / Our CHAUSSON TITANIUM 640 rewarded ! 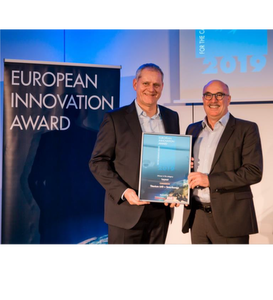 This prestigious award is attributed by a board of 17 European magazines, caravaning experts. The 640 layout is a creation « made in Ardèche » which has already been rewarded. The originality of this layout is the space and comfort you feel in only 6,99 m: maxi « face-to-face » lounge, large hideaway bed 160 cm width, maxi bathroom, dressing and garage. Its concept « Smartlounge » enables to transform quickly bench seats into 2 comfortables seats for road use. The 640 is not only appreciated by professionals. It is also, by far, the N°1 best-seller for individuals in Europe. TITANIUM (special series on Ford with automatic gearbox) but also in version WELCOME which makes it possible to choose its base vehicle (Fiat or Ford), its level of equipment (VIP, PREMIUM), and to benefit from different furniture and fabrics.